Like Gremlins and Tremors, Grabbers is equal parts horror and comedy that mix together to make enjoyable entertainment that goes down smooth. It's definitely a throwback the those classic "monsters invade a small town" movies that started in the '50s, but with a great twist. Instead of characters being scared and try and survive, they get plastered to better their chances of survival. The cast is perfect! Richard Coyle and Ruth Bradley have great chemistry as our two leads, Lalor Roddy is hilarious as a salty seaman, and David Pearse and Bronagh Gallagher are equally silly as the proprietors of the Maher Pub. The squid-like creatures that threaten our hammered heroes are gooey, grabby, and surprisingly deadly; a movie monster that not only looks great, but is a believable threat. This is a perfect creature feature to watch with friends while you laugh it up and drink it up, too! 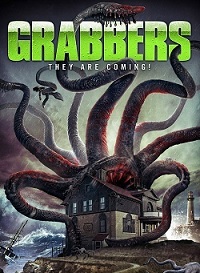 Grabbers is a fun, fright flick that knows what it is, has many surprising turns, several scares, lots of laughs, and let's you know that it's bottoms up when battling beasts from beyond. Fun Fact: The film's shot during the harshest winter in Ireland in over a hundred years. Uncharacteristic blizzards, gale force storms and sub-zero temperatures regularly hampered production, creating a difficult shoot.